Working people in Moscow-occupied Crimea have faced growing shortages of food and other necessities from a blockade on the Ukrainian side of the peninsula’s border initiated by Crimean Tatars there. The effects were greatly magnified when explosions on Nov. 20 and 21 cut electricity for most of Crimea’s 2 million residents. The blockade was initiated by leaders of the Mejlis, the Tatar parliament, to protest Moscow’s March 2014 occupation and annexation of the territory from Ukraine. Paramilitary forces from the Ukrainian nationalist Right Sector party have joined in its enforcement. The effects disproportionately hit working people, including tens of thousands of Tatars in Crimea. Many schools are closed, trolley buses can’t run and 40 percent of residential buildings remained without heat as of Dec. 4. The action began Sept. 20 with roadblocks stopping commercial trucks on the three highways that connect mainland Ukraine to Crimea. 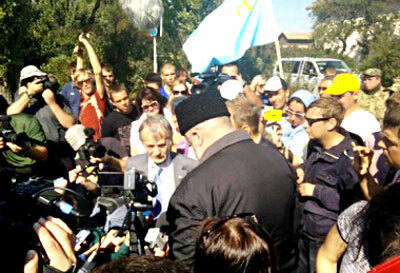 Mustafa Dzhemilev, the historic leader of the Tatars’ fight for national rights and former political prisoner in the Soviet Union, laid out the protesters’ immediate demands — Russian authorities must release Ukrainian and Tatar political prisoners, end political repression, investigate the murders of 22 Crimean Tatars on the peninsula and lift the ban on Dzhemilev and other Tatar leaders from returning to their homeland. The ultimate goal is “for the occupiers to leave our territory,” he told the German news website Deutsche Welle. Dzhemilev and Mejlis Chairman Refat Chubarov, both banned from Crimea, expressed frustration with Kiev’s tacit acceptance of the Russian annexation as an accomplished fact. “The Crimean issue is getting forgotten” in international negotiations, Chubarov said Sept. 21. 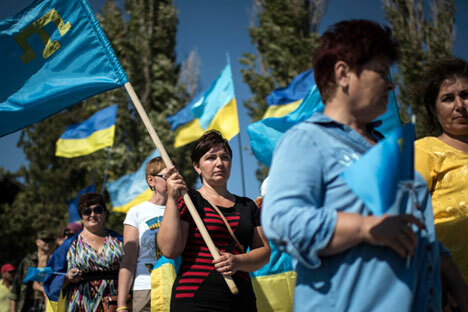 Local residents carry Ukrainian and Crimean Tatars flags at the Village of Chongar. The Nov. 20-21 explosions knocked out four electrical pylons in Ukraine’s Kherson region, cutting off at least 70 percent of Crimea’s power. No one has claimed responsibility, but the blockaders are preventing most repairs needed to restore electricity to the peninsula. About 100 Ukrainian National Guard troops briefly clashed with those blocking access to the damaged towers, but then backed off. On Nov. 23 Kiev imposed a formal embargo on sale of goods from Ukraine to Crimea, after Dzhemilev and Chubarov, both of whom are members of parliament, met with President Petro Poroshenko. Chubarov announced Dec. 6 that protesters would allow partial restoration of electricity to Crimea. The Tatars are Crimea’s native inhabitants who have suffered national oppression since the conquest of the peninsula by czarist Russia in 1783. After the 1917 Bolshevik Revolution, the Tatars established an autonomous socialist republic in the newly formed Soviet Union, as did the Ukrainians. These moves were backed by V.I. Lenin and the revolutionary Bolshevik leadership in Russia, who promoted Ukrainization and national rights for Tatars in Crimea. Use of native languages and culture flourished and national pride grew. But in the late 1920s, a growing Soviet bureaucratic caste, led by Joseph Stalin, carried through a bloody counterrevolution against Lenin’s policies, including trampling on national rights. During World War II, Stalin slandered the Tatars as Nazi collaborators and forcibly deported the entire population to Uzbekistan, Siberia and the Urals. Nearly half perished. Stalin encouraged Russification — transferring ethnic Russians to repopulate Crimea. After the Soviet Union imploded at the opening of the 1990s, increasing numbers of Tatars returned to Crimea. By 2014 the Crimean population was about 12 percent Tatar, 25 percent Ukrainian, and 58 percent ethnic Russian. When popular mobilizations overthrew Moscow-backed Ukrainian President Viktor Yanukovych in February 2014, Russian troops without insignia poured into Crimea, home to a naval base Russia leased from Ukraine. Within weeks a rigged referendum to secede from Ukraine and join the Russian Federation was pushed through using a mix of thuggery and propaganda that the new government in Kiev would take away rights of Russian speakers. The overwhelming majority of Tatars opposed the annexation. Along with other opponents of Moscow’s rule, they have faced harassment, arbitrary arrests, disappearances and murders. The only Crimean Tatar television station, ATR, was forced off the air in April when authorities refused to renew its license. Akhtem Chiygoz, deputy head of the Tatar Mejlis, has been detained without trial since January. The higher food prices and extensive blackouts as a result of the blockade especially affect working people in Crimea. This comes on top of the impact of sanctions imposed by Washington and the European Union. Defending the tactic of maintaining the blackout, Dzhemilev told the Kiev Post Nov. 25 that “it’s bad without electricity, but prison is worse,” reiterating the demand for Moscow to release political prisoners. The Tatars in Crimea “are ready to suffer for some time to allow the pressure to take effect,” he said. “There can certainly be differing views regarding the sense, morality, etc. of the blockade and now the blackout,” Coynash wrote in a Nov. 30 article, “but surely not about the totally reasonable demands made” by the Tatars.